To the left of this photo, is the Swan Brewery on Moor Street / Mount Pleasant. 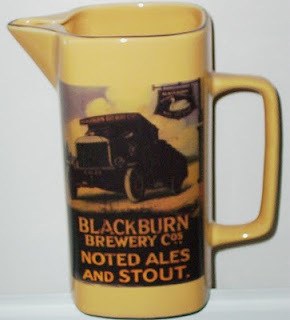 Built in 1894-5, it was owned by the Blackburn Brewery Company. They sold it in 1928 to Dutton's (along with 100 pubs) and although brewing then ceased at the site, Dutton's used it for storage and garaging, right through to the 1960's. The pub on the right, is Ward's Hotel, which stood on the corner of Syke St and Cleaver St. I can remember, as a kid, in the early 1960's, playing on that cleared site between the rear of the pub and Holy Trinity Church, though I think the pub had also been demolished by then, as I don't recall it. BREWERY INFORMATION COURTESY OF MIKE ROTHWELL. PHOTO COURTESY OF COTTONTOWN AND THE COMMUNITY STUDIES DEPT. BLACKBURN LIBRARY. Darren - Please see my previous comment (the one below this). But also, if you look at this photo and see where the brewery is in relation to Holy Trinity Church in the background, you'll see it's approximately where the health centre is today. 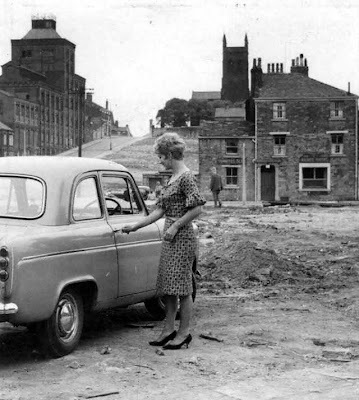 If you stand on Barbara Castle Way today, with your back to Thwaites Brewery wall and look towards the church, the health centre is just to your left. Cheers Angie. As mentioned in the post, I was a mere child when all this area was being demolished in the early 1960's. I'm sure there may be others looking in, who remember your family though. Thanks Colin dont know if you can help but I was brought up in the Stakes Hall pub in Mill Hill, it has now closed and I am trying to find out what it was before it was a pub. I don't Angie. I just assumed it had always been a pub. It looks like a purpose built, corner of the street boozer. I've just had a look in my 1894 directory and it was a pub back then, it's entered under Hotels, Inns & Taverns, just as Stakes Hall, Albert Street. Stake's Hall Hotel was just a pub. The area was known as Stakes Hall or Hall of Stakes. There was possibly a Stakes Hall at an earlier period but like many buildings of antiquity in this area they have disappeared without trace.